It’s not always easy finding a holiday gift for someone. You’ll need to make sure it is something they will love, something they will use, and something they don’t already have. If the gift you have in mind fits all these requirements you can buy the gift and then deal with the hassles of wrapping it. Don’t forget you will also have to conquer the challenge of going to the store to pick the gift up, something many of us dread during the holiday season. Instead of dealing with the stresses of conventional holiday shopping, why not take a different route and attend a City of Buffalo Artists Market hosted by Sarah Danielle Women’s Boutique. This event will hold a plethora of local artists and shops and will surely have something for everyone on your list. Upon arrival at the event, free parking will be available at our Washington and Swan parking lot, and street parking will be available surrounding the building. Whether you choose to eat before or after you shop, local food trucks will be serving food throughout the event and the cash bar will be serving drinks. Enjoy music while you browse the interesting and creative merchandise and once you’ve made your purchase(s), have us gift wrap your present for you. Don’t forget to take a picture next to the enormous Ellicott Square Building Christmas tree. On average, the tree ranges in height from 25 to 30 feet tall and has been part of Ellicott Square Christmas tradition for over 40 years. 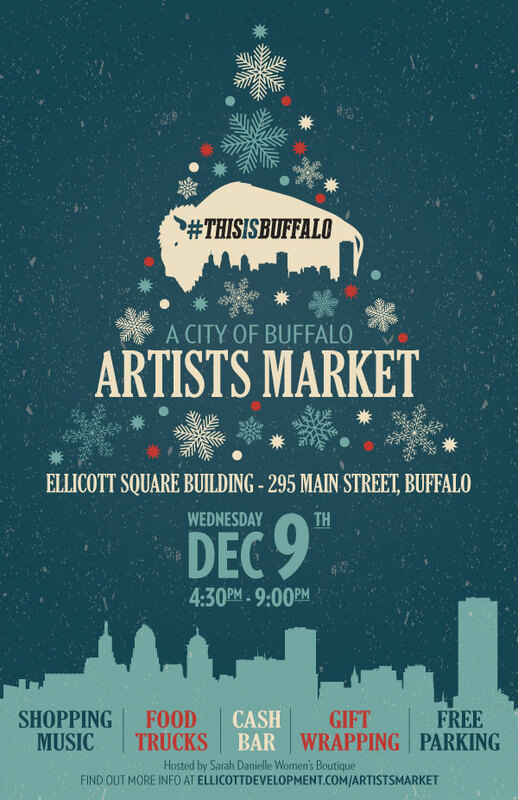 A City of Buffalo Artists Market will take place on December 9th from 4:30pm to 9pm in the lobby of the Ellicott Square Building. This event will be hosted by Sarah Danielle Women’s boutique which is also located in the lobby of the Ellicott Square Building. 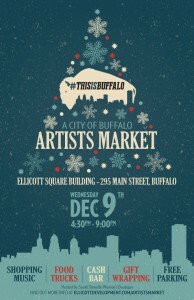 To find out more information, check out www.ellicottdevelopment.com/artistsmarket.